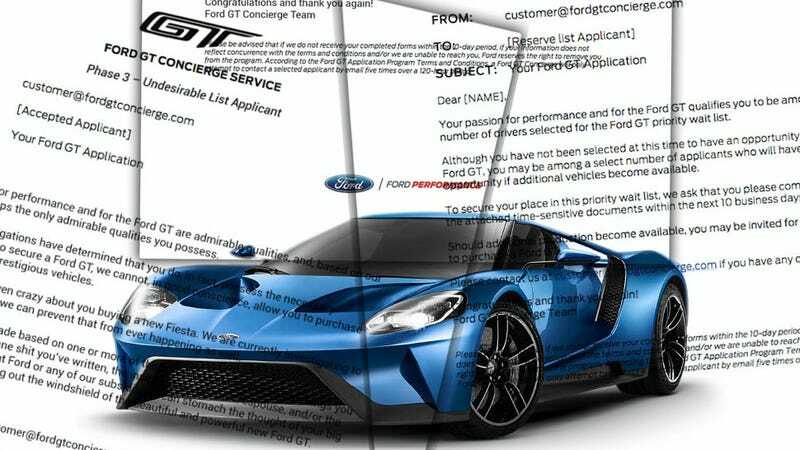 Earlier today, we showed you the Ford GT rejection letter, and we all had a good cry, together. As you know, though, even when a car company gets to decide who is worth the privilege of buying their car, some people must be getting good news, right? Happily, we’ve now managed to get samples of all the types of letters sent to potential Ford GT buyers, and they’re surprisingly good. The letters are divided into two “phases.” Phase 2 letters cover people who were rejected, accepted, or waitlisted. Phase 3 letters seem to cover more specific circumstances. They’re all technically rejections, but for whatever reason, Ford decided the people in those categories deserved a different letter than the stock Phase 2 rejection. Now, the Phase 3 letters are a little more interesting.